This is the third blog post on our round the world trip August – November 2016. It covers the first half of our drive through the Kimberley in north-west Australia. We had long wanted to drive from Darwin to Broome on the legendary Gibb River Road in the Kimberley and finally we were to achieve our aim. Our initial researches on the Internet pointed to either joining a tour group, which we did not want to do, or renting a 4WD camper which did not appeal either. Places to stay on the Gibb are few and far between and we also found that renting a vehicle on our own was prohibitively expensive. Finally, via a very complimentary mention on tripadvisor, we came across Bluey Travel who specialize in self-drive trips in the north of Australia. This fitted the bill exactly and we had absolutely excellent service from them. They organized a vehicle with unlimited kilometres, accommodation in lodges and also provided a comprehensive handbook of what to see and do en route. They willingly rescheduled the trip by a few days after we found the cruise. 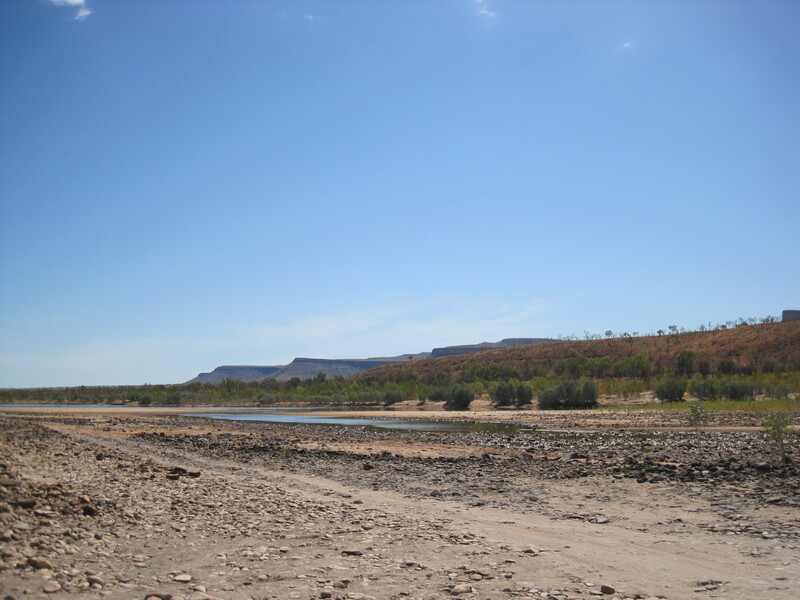 There are only two seasons in northern Australia, the dry (May to October), and the wet (November to April) when most things are closed. The area is also inhabited by the saltwater crocodile, one of the world’s more dangerous animals. This was our second visit to Darwin, 15 years after our first. 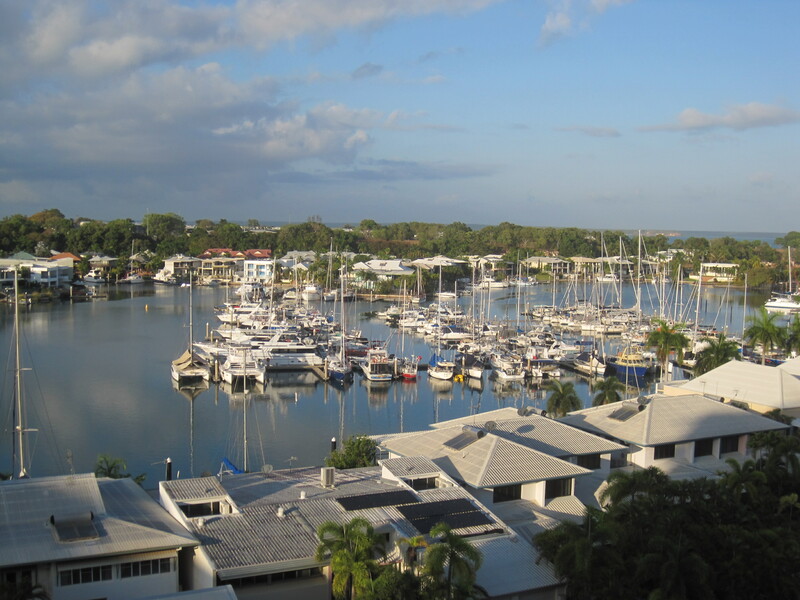 This time we were in an apartment hotel a bus ride from the town centre, but overlooking the marina. It was a short (but long enough in 37C) walk down to some shops, restaurants and, fortunately, a laundromat which was our first priority. Here we got another taste (no pun intended) of Australian food. Quiche and salad for lunch were very good but the coffee shop where we ate it closed at 2.30. We walked down to the same area again for dinner to a fish and chip cafe. 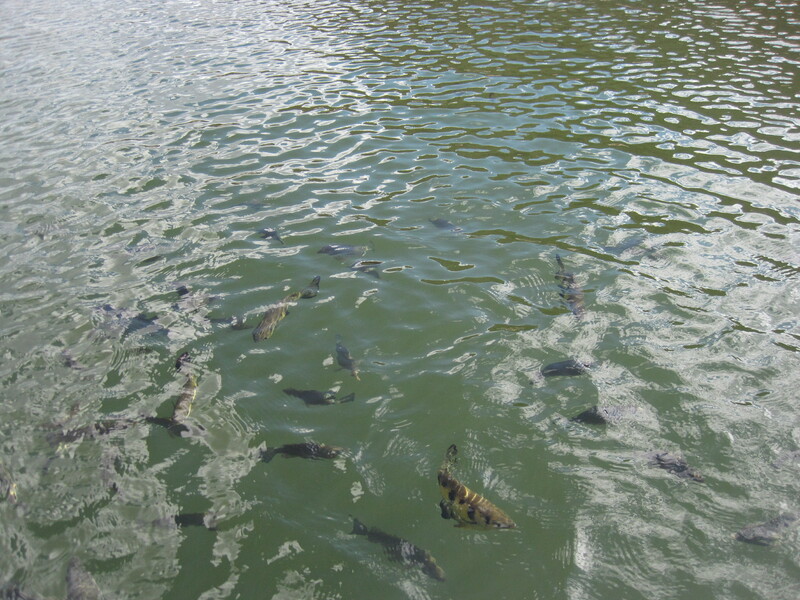 There we were confronted with choice of fish, hardly any of which we had heard of. Barramundi and snapper turned out fine. We were glad we had taken the server’s advice and ordered one half portion of chips between us. There was no vinegar – no Yorkshire people here. The next night we ate in a Greek restaurant where I was served the largest portion of moussaka I have ever seen. We did manage some sightseeing on the one whole day we had in Darwin. We took the bus to town and caught up with e-mail in a square with free wifi. Parts of the town did look rather like Edmonton (where I lived for 3 years) in the tropics. 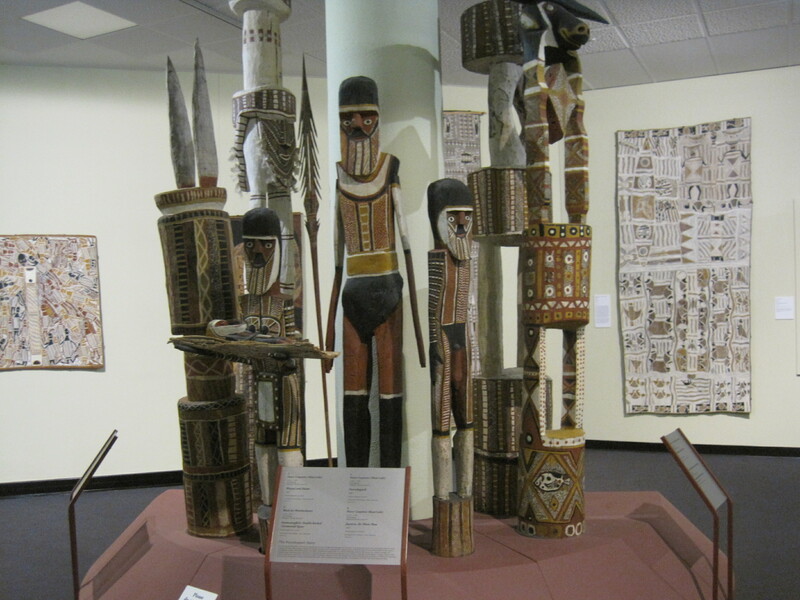 Then we took another bus to the Museum and Art Gallery of the Northern Territory which was another excellent museum. There was some wonderful aboriginal art, natural history exhibits (including some of the many nasties that live in Australia), and a huge warehouse-like building full of ships. There was also a room devoted to Cyclone Tracy which severely damaged Darwin on Christmas Day in 1974. Some of the people looking at it must have lived through it. An exhibition of political cartoons would have been very amusing if we knew more about Australian politics and history – we did find that the Australian sense of humour is very like ours. We had another large but imaginative lunch in the museum cafe where I supplemented my five-a-day with watermelon juice. At the end of our visit to the museum we had our first sight of some aboriginals. Two came into the museum entrance shouting and swearing at each other. Another two got on the bus. One had no money for the fare and the driver immediately radioed his base. She eventually got off. All of this was totally ignored by all the white people around. We picked up a large 4WD (a Mitsubishi Pajero, Shogun in the UK) from Thrifty on our second morning in Darwin and found a mall for a few purchases including a very useful coolbox which the Austrlians call an esky. We couldn’t buy too much food as you can’t take some items of fresh food into Western Australia. Just after lunch we set off on the Stuart Highway south to Katherine, a road that we drove in 2001. It was a dual carriageway for some of the way, but not for too long. We had our first encounter with Australian road trains where they have 3 or 4 full-size trailers. The scenery was more like bush with just a few small hills. 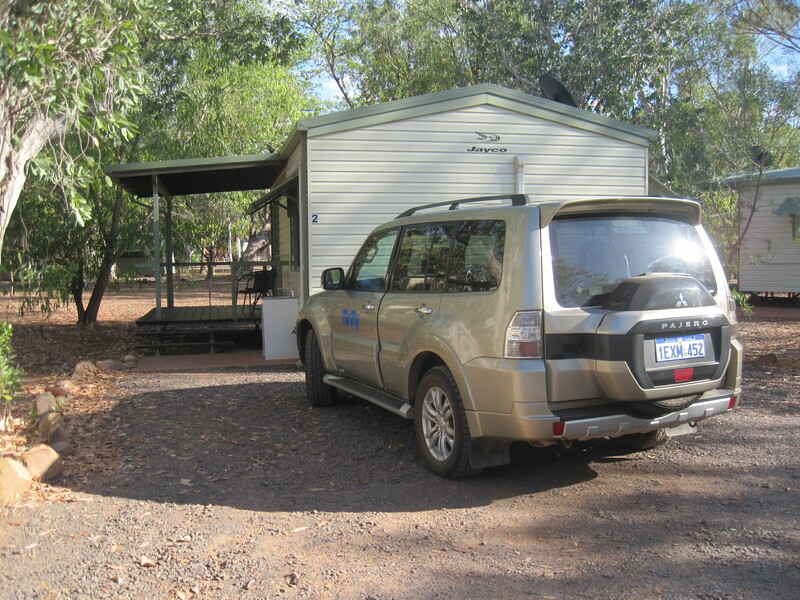 We were booked into Nitmiluk which is a tourist site with campers and chalets some 30km from Katherine. Our chalet was huge, with a big living area, well-equipped kitchen and bathroom. We ate another rather large meal outdoors by the swimming pool. Little wallabies were wandering around. 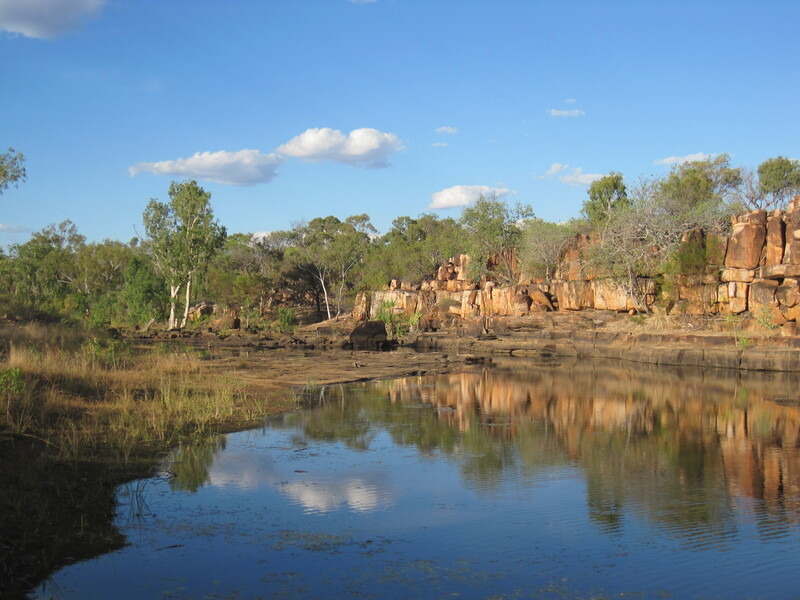 Nitmiluk is the tourist base for the Katherine Gorge where you can take a boat trip and perhaps see crocodiles. However we didn’t stay long on the next day as we had done the boat trip in 2001. Next day we began to get a sense of the distances. It was over 500km of paved road west to Kununurra. I think it was today that the temperature reached 41C. The scenery was much the same for most of the way with bush and small trees and hardly any habitation. Occasionally we saw cattle, mostly the white ones with long floppy ears. There was barely anything at Timber Creek, the one possible overnight stopping place we had seen on the map. We took a small detour to Joe Creek for a picnic lunch (and a change of scenery). At one place we passed a fire by the side of the road which looked like it might get nasty. 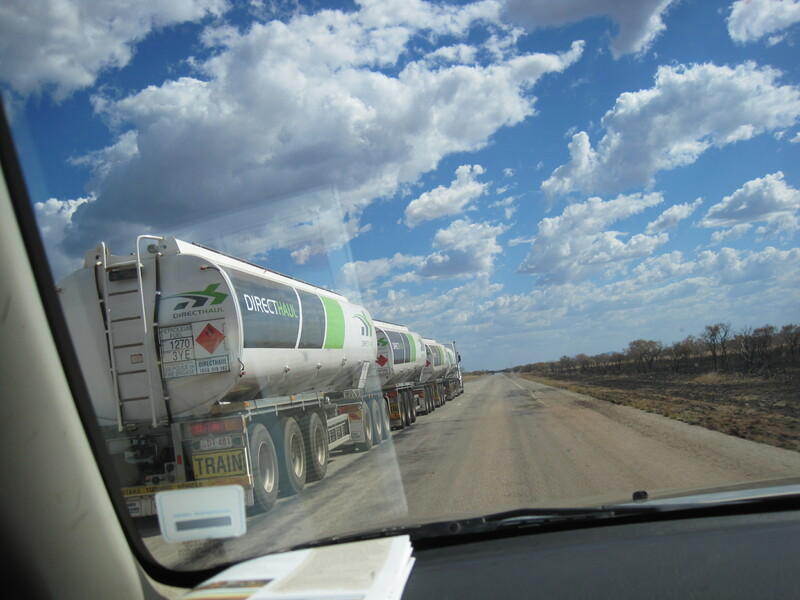 We managed to overtake a road train which consisted of 4 fuel tankers. We also stopped briefly to walk on the bridge over the Victoria River in the hope of seeing some crocodiles but there weren’t any. We crossed into Western Australia (with a 90 minute time change), eating our one remaining apple to satisfy the quarantine officer. 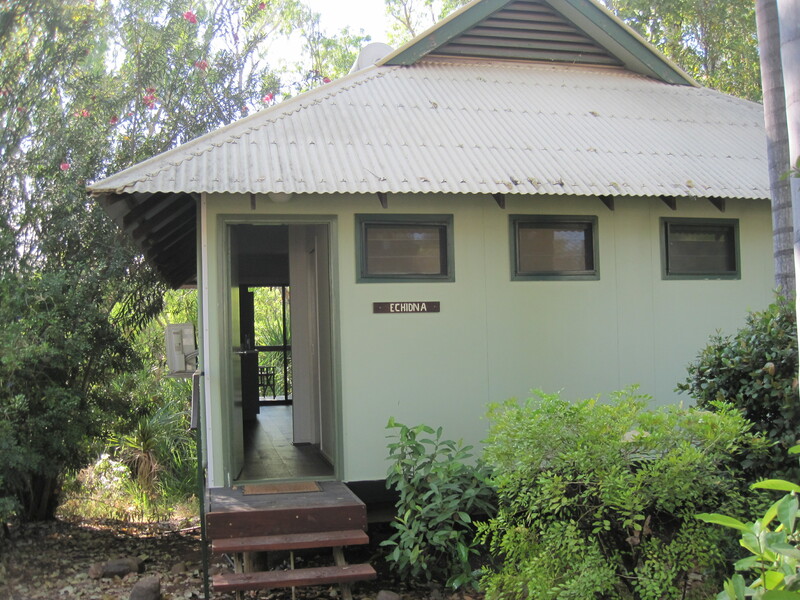 We arrived at a nice apartment motel (Lakeview) in Kununurra in the late afternoon. By now I had acquired a nasty cough (soon fixed with some Australian cough medicine), I think because it was so cold inside the museum in Darwin, and so this was the first of several evenings when we bought a couple of TV dinners and used the kitchen facilities to eat in. As we were now definitely going out into the wilderess we did more shopping for food in Kununurra, which, with a population of well under 10,000 is the largest place for hundreds of miles around. Groups of aboriginals, not wearing the best of clothes, were lounging around in the shade, ignored by everybody else. The next day was a lot more driving. We were on the main highway for about another 3.5 hours, passing just 2 roadhouses. Finally we turned off on to a bone-shaking very corrugated road. 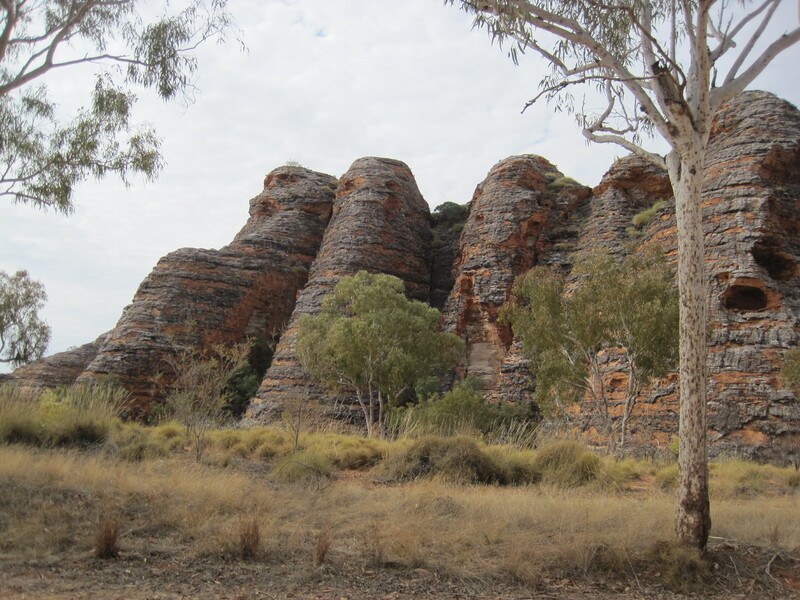 It took 2.5 hours to drive the 53km to the visitor centre for the Purnululu National Park which contains the Bungle Bungles, a series of red striped dome-shaped hills covering a huge area. The visitor centre was as good as the American ones and we got an excellent map. It was another 20 minutes to the Bungle Bungles Wilderness Lodge. There we were in a safari tent on a raised platform with a bathroom in the rear of the tent and a nice deck at the front. The lodge had a big open plan communal area and tea was available all the time. A large group arrived in a 4WD bus just after us. We learned that they had had to change their itinerary because it had rained the week before – not good for unsealed roads. There were a few other ‘self-drivers’ and we had a good conversation with them over a nice dinner. As in other places we came to, several of the kitchen staff were young people on working visas. On the way back to our tent we saw two frog-like things which looked like cane toads, although we had seen notices about keeping them out of Western Australia. Next day we got to breakfast before the big group then drove to Piccanniny, the parking place for the sights at southern end of the park. There were a lot of people there, presumably campers although the camp site is just off the main road 60km away. We did a short walk round the domes. It was another 1km into Cathedral Gorge. Here we got our first taste of the dramatic scenery in the Kimberley. Most of the time you are driving through a landscape of small and thin eucalyptus trees which looks fairly dull, but the terrain is interspersed with spectacular gorges. Their sides are rocks coloured from yellow to deep red and ochre and they mostly contain pools or lakes of water. The trail to Cathedral Gorge was mostly on a dried river bed but there was one easy ladder and some railings on a ledge. The gorge is really a huge amphitheatre with a small pool. It made the people inside it look very small. We eventually found the rock art near the entrance. We then drove up over more corrugated road to the northern end of the park. 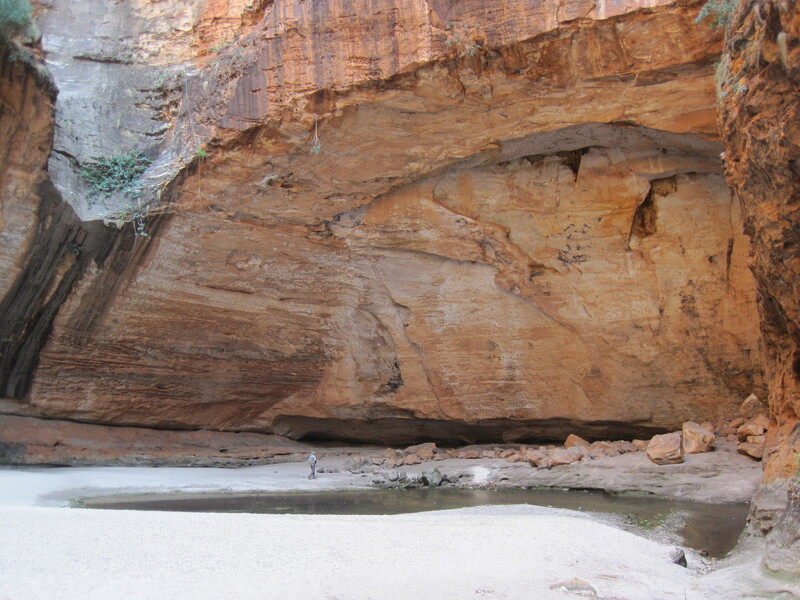 Martin did another 45 minute walk in Echidna Chasm which was more like the slot canyons in Arizona. I had an interesting talk with Graham and Prue from Melbourne who explained to me how their 4WD tent camper worked. They said that when they set off they had intended to go to Cape York, which is the northernmost point of Queensland, but the weather forecast was bad so they had decided to go to the north-west instead, this in a country almost the size of the lower 48 states of the USA. They also had a smart GPS which could send e-mails telling their family and friends where they were. Back at the wilderness lodge, and after chatting to some of the group, we decided to bite the bullet and to book a 30 minute helicopter trip for the next day. A cow walked past our tent during the evening and two more in the night. We heard that the group was leaving at 6.30 and so had our breakfast in peace at 6.45. 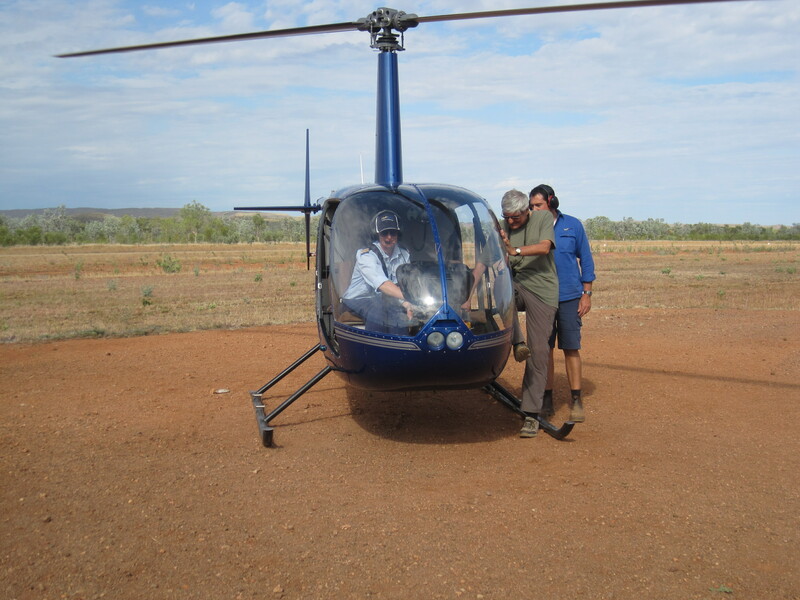 It was a short drive to the airstrip where we were weighed and told not to have anything loose in our pockets. Our helicopter had seats for 3 passengers. Martin sat in the front next to Bridget the pilot and I was in the back. It was open-sided and we were strapped in only by what seemed to be car seat belts. I was terrified about losing my camera, as we had to leave camera cases behind, and I had it fastened to my wrist all the time. We had 30 minutes of flying over amazing scenery including where we had walked the day before. 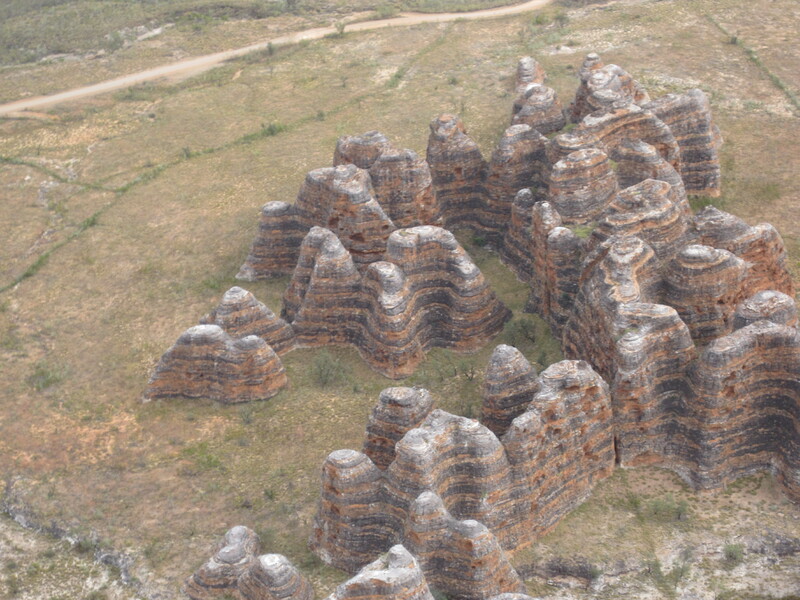 There are hundreds of red striped domes and the best view was definitely from above them. It took less time to drive back from the Bungle Bungles over the corrugated road to the main road. We stopped at a roadhouse where the choice for lunch seemed to be only meat pies. We had to retrace our steps almost all the way back to Kununurra then turned off on another gravel road to El Questro. There were more corrugations. We turned a corner and suddenly found that the road crossed a river which seemed fairly deep. We just waited for another vehicle to drve through to check the depth and found that the Pajero was absolutely fine. 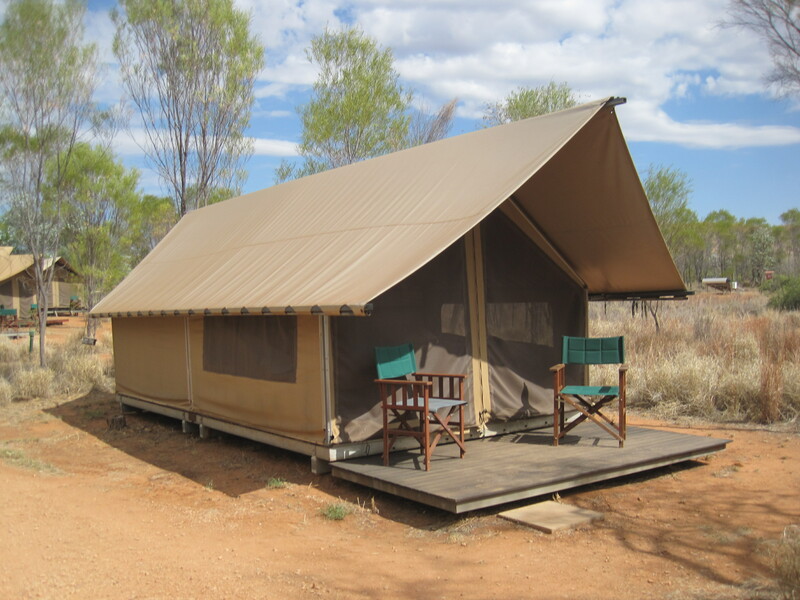 El Questro is perhaps best described as a kind of holiday camp in the Kimberley. There is a shop, a restaurant, bar, camp site, petrol station and chalet accommodation. They actually have more than one site but we were in the main one called The Station and housed in a semi-detached chalet bungalow called Echidna. It looked fairly nondescript on the outside but inside it was very modern and it had a nice deck at the back looking down on to a narrow river. There were some lovely Kimberley prints on the wall. Our first dinner there was only so-so probably because the restaurant was called ‘Steakhouse’ and we did not have steak. We discovered that the Australians use the term ‘entrée’ for starter and ‘main’ for the main course which is confusingly called an ‘entrée’ in North America. I managed to negotiate a salad for a starter instead of the protein-heavy offerings on the menu. Dinner on the second night was much better. In the morning of our one full day there Martin went on a sweaty hike into El Questro Gorge and came back saying he had had to take a detour and had been spooked by a big snake under a palm leaf. 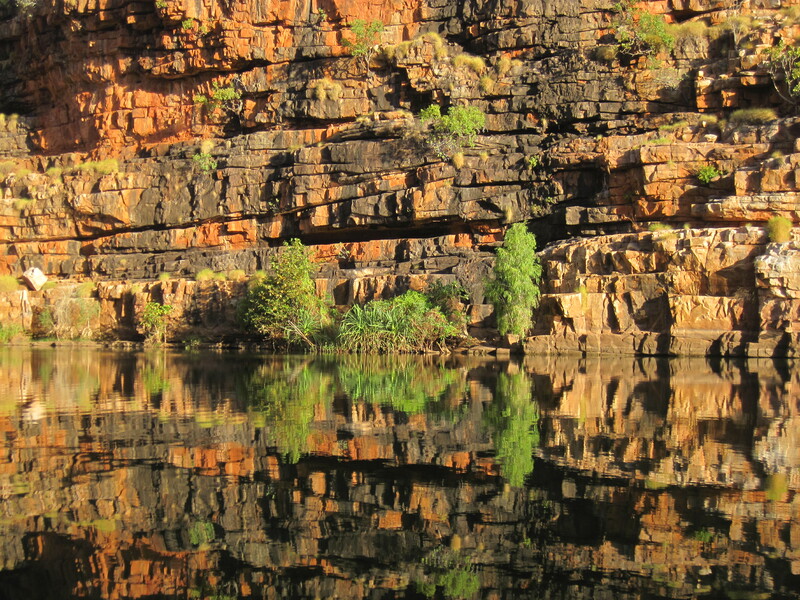 In the afternoon we did the boat trip in Chamberlain Gorge and the reflections of the cliffs in the water were superb. We were entertained by feeding some spotted archer fish. When they see food in your hands they spit water 5-6ft up at you to try to dislodge it. We met Graham and Prue on the boat again. There were no crocodiles. The next day we set off early, first to visit Zebedee Springs near El Questro station. 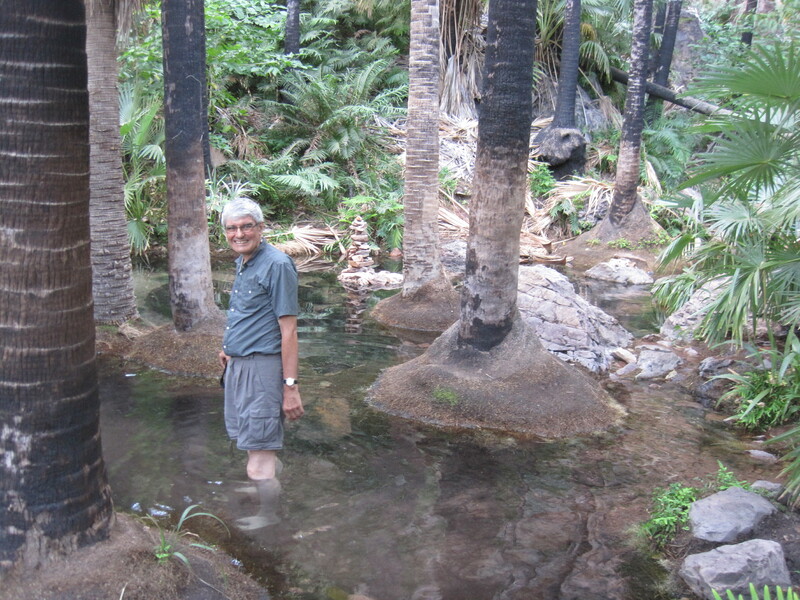 This was an easy walk through palm vegetation to some thermal pools. Some people were bathing in it. 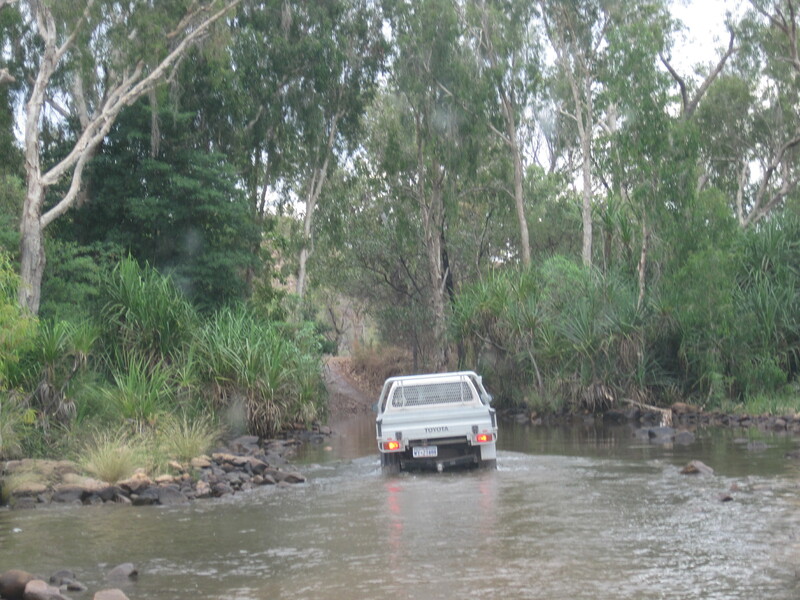 Then we were about to start tackling the Gibb River Road proper and the infamous Pentecost River crossing where there are known to be crocodiles. When we got there we saw that there was no water in it. We later learned that most of the locals had never seen it like this before – the last two wet seasons had not been very wet. We just drove across a stony marked-out causeway. There was a little bit of water to the side but no crocodiles. The Gibb turned out to be a better road than we had been led to believe. It’s wide enough for two vehicles and the gravel was quite well maintained with not many corrugations. The road is paved on the steeper bits which are called ‘jump-ups’. It was almost the end of the season and there wasn’t much traffic, but we felt quite comfortable on our own. We were still driving through light eucalyptus trees and bush. Our destination that day was Mount Elizabeth station which is one of the better known working cattle stations. It was 30km off the Gibb over a wide gravel road and we arrived there in time to take a short trip over the worst bit of road we had seen (ruts and rocks) to Wunumurra Gorge, another beautiful spot with a sandy beach by some water. By now we were out of the area for crocodiles (I hope) and just enjoyed the peaceful scenery in the early evening. We nearly hit a cow on the way back. Some other clients of Bluey travel were staying there as well as some Germans who had had plenty of problems with tyres. We had another interesting conversation over dinner. One of the girls who served us thought that the snake Martin saw at El Questro sounded like a king brown. Very poisonous. Mount Elizabeth was established by the Lacy family. We found a book about them and their history. Next morning we asked to meet them. Peter was away but Pat was happy to talk about life on the station. Their children had done the school of the air and then finished schooling at Perth, over 2500km away. Pat told us that she has a medicine cabinet with numbered items. If she needs the doctor she calls and they tell her which numbered pills to use. She also told us that a month ago a guest had had a heart attack at the gorge and the flying doctor came to their airstrip at 9pm. Where is the Pentecost River? This entry was posted in Uncategorized and tagged Bungle Bungles, Darwin, Darwin museum, El Questro, Gibb River Road, Katherine, Kimberley, Kununurra, Mount Elizabeth station, Nitmiluk, Pentecost River. Bookmark the permalink.